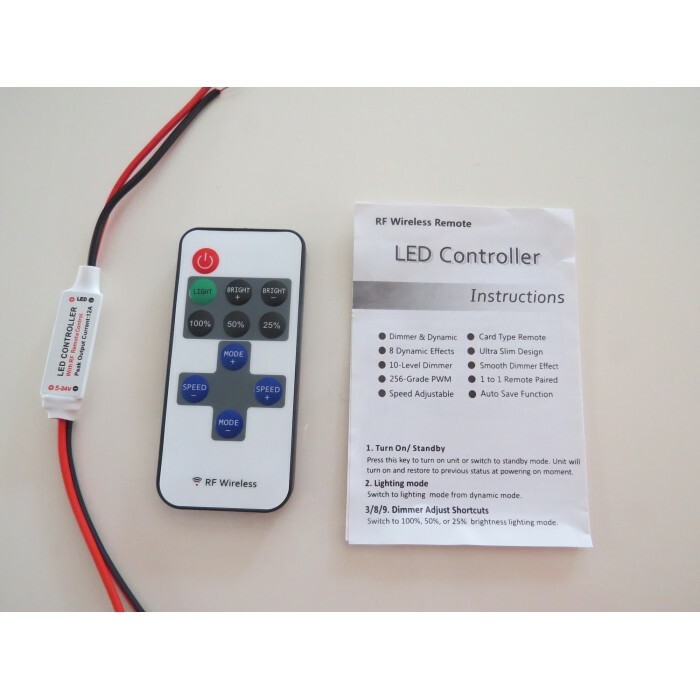 Simply connect the receiver between your LED driver & your LED lights & the unit will give you full remote control within 15M of the receiver unit. Will work with any driver, transformer or battery supply between 5V & 24V. 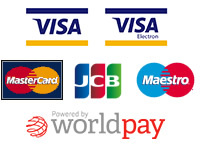 1.Turn On/ Standby - Press this key to turn on unit or switch to standby mode. Unit will turn on and restore to previous status as it powers up. 2. Lighting mode - Switch to lighting mode from dynamic mode. 3/8/9. Dimmer Adjust Shortcuts - Switch to 100%, 50%, or 25% brightness lighting mode. 4/6. Dynamic Mode Adjust - Switch to dynamic mode from lighting mode, or switch between different dynamic modes. 5/7. Speed Adjust -Adjust playing speed of dynamic modes. Press SPEED+ to increase seed and press SPEED- to decrease. 1. Power Supply - DC 5V to 24V power supply. The red cable should be connected to positive and black cable to negative. The red cable should be connected to LED positive and black cable to negative. The peak output current is 12A, max continuous current 6A please reduce load if main unit is overheating. CAUTION: Do not short circuit the LED output, this may lead to permanent damage! 3. 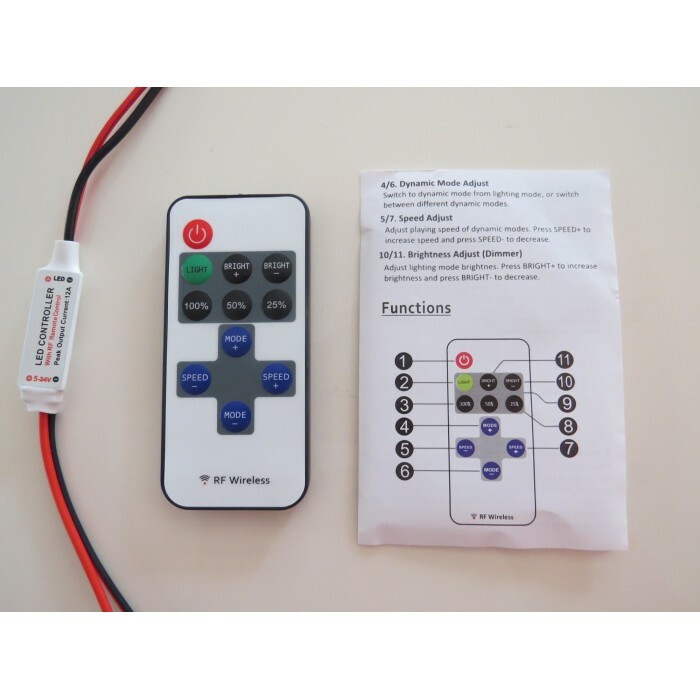 Remote Control – The unit is supplied with an insulator in place for safe transport & to ensure it arrives with you with a full battery & ready to use, just remove the insulator (slide out from battery compartment). The RF wireless remote signal can pass through wood, walls & similar materials, so it's not necessary to aim at the main unit when operating. Do not install the main unit withiin closed metal parts. 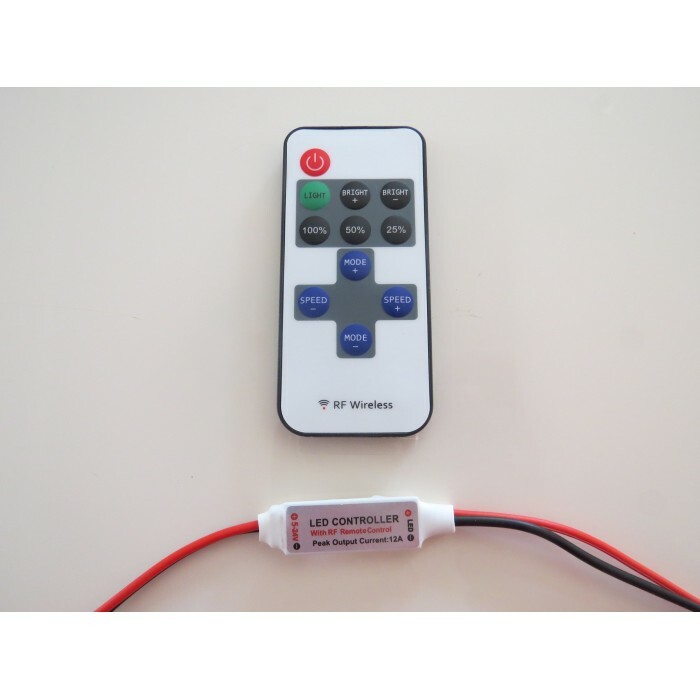 The remote battery is 3V CR2025 type, please only replace with same type.